Uploaded by Liz HenryDid I mention I’m sporting a fashionable non-haircut these days? It’s quite nice. Low maintenance AND an immediate challenge to the way people want to perceive me. I like that. When someone does a double-take, I get their attention for longer on the second glance. It gives me the opportunity to define myself with more than my appearance. Maybe a few words or a smile. But enough about me. Check out more WoolfCamp pics. Ooh and ahh at the babies. Imagine the sound of a room full of women tapping away on their laptops. It’s very similar to the sound of rain falling in a forest. somehow i resisted rubbing your head. now i wish i hadn’t! 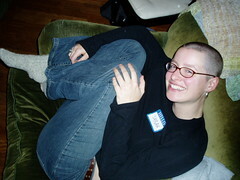 Further to your non-hair, I was concerned that you had lost your hair because of cancer treatments. Good thing I didn’t open my fat trap on that one. Sarah? You were my favorite person at WoolfCamp. Don’t tell the others. Women – you are truly an inspiration. Not only on the creative side – but on the spiritual as well, and I hope we have many opportunities to keep the conversation going no in the future. Sarah, It was so great to meet you this weekend. Your poetry rocked; hope I get to see/hear more of it sometime. And I like your non-haircut. I will use the word “fetching”. Sarah, a TOTALLY CUTE pic of you at Woolfcamp! I, too, dug your “non-haircut.” You are a beautiful woman and I admire you. If I’m not in Hawaii at the time, I will see you at BlogHer. Fab picture of a completely beautiful young woman. Wonderful meeting you, Sarah and thank you for one of Woolfcamp’s finest moments…your poetry readings. Perfection. Thanks so much, as well, for your kind and generous hosting offer. Hope to see you at BlogHer.